We like this spot for many reasons. 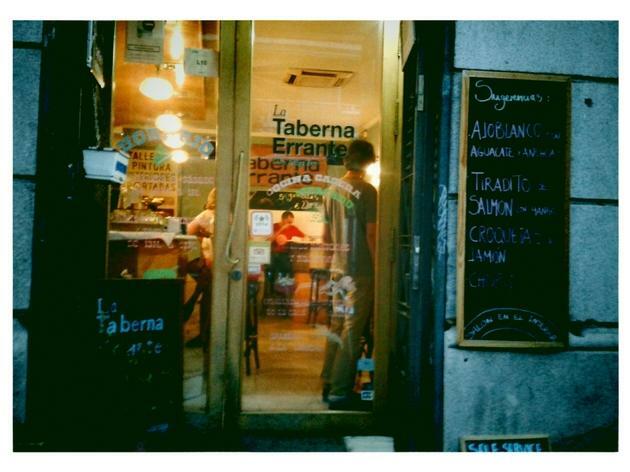 The first is that it’s on the fringes of the tapa route that spans La Latina so it’s not as packed as other places in the area. Still, it’s advisable that you book at weekends anyway if you want a chance of getting a table. 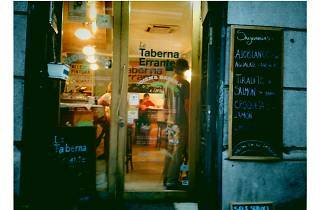 Second, La Taberna Errante has won over so many locals in the area, which is always a good sign. You’ll often see owners and staff chatting away with their customers (mostly in their 30s), who they treat like friends, and vice versa. It’s easy to be loyal to the place and its people. The entrance opens to a humble and welcoming lounge with just a few tables. When the weather permits, they put another four tables outside in the front. It’s not the most tempting terrace you’ve ever seen (a narrow pavement, with cars parked practically at your feet), but it does offer a peaceful respite when surrounding streets and squares get overcrowded. Plus you get a view of the dome of the San Francisco el Grande Royal Basilica. But, without a doubt, the main draw that appears in our dreams and keeps us coming back from more is their Russian salad. Order this ‘ensaladilla’ as a tapa (you’ll get a generous serving) and you’ll already be planning your next trip back as well. The texture and flavour seem to have been waiting for each other their whole lives to make this perfect combination. Their ensaladilla is the litmus test of what they can do in the kitchen, and their relationship with traditional recipes that are behind other contenders fighting for the title of house classic: the croquettes and the ‘morcilla’ (black pudding) truffles. Everything’s made with zeal and care. As devotees to seasonal produce and for something cool and light to compensate for the heat outside, in summer you’ll find dishes like salmon with mango salsa and citric flavours, ‘ajoblanco’ cold soup with avocado and anchovies, and ‘chopitos’ (a type of fried calamari). Summer also means you’ll find their usual menu but in a reduced format, with grilled octopus, home-made nuggets, meat with tomato, and other dishes to share, with new items added now and then. So take a break with any of their mouth-watering delights, a bottle of wine from their small but strong selection, and their ‘de la leche’ cake (a family recipe that’s also, of course, a secret one) as you relax a bit away from the noise of surrounding streets.